Childbirth takes its toll on the body, regardless of what type of birth you had. You may feel disconnected from your pelvic floor or abdominals or even your whole body. The trick is to start slowly and build up, listening to your body as you go. Low impact movements, hydration, good nutrition and rest (where possible!) are key to rebuilding your body. You will need to wait until you have had your 6-8-week (for vaginal birth) or 10-12 week (for C-section) check-up before starting formal exercise. All sessions are suitable for diastasis recti (tummy separation), pelvic girdle pain and certain types of pelvic floor dysfunction and prolapse. I offer several options for new mums, some of which allow you to bring your baby. Personal Training- After your initial screening, we will sit down and talk about the birth and your body. From there we can start to reintroduce you to movement and exercise combining fitness and Pilates techniques. You will also be given homework to practice at home. Please contact us for locations. Home sessions may be available depending on location. Please see the Personal Training page for prices. 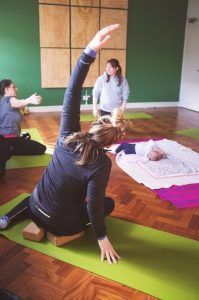 Postnatal Pilates Classes- Using the principles of Pilates, the classes will focus on reconnecting with your pelvic floor and deep tummy muscles again. Over the weeks, I will introduce modified movements to help improve your posture, flexibility and strength. Babies are welcome to attend the classes, but there is limited storage for prams. Classes will also be capped at 8 people to allow for personal attention. See the Timetable page for current classes and the Pilates page for prices. Holistic Core Restore® Pelvic Floor & Core Fitness Programm -This is a 12-week fitness based course aimed at improving your pelvic floor and all over fitness. Although not specifically for postnatal bodies, this program is perfect for healing after birth. Included with the program is all the kit you need, an education booklet, access to an online exercise program (forever!) and ongoing support via a WhatsApp group. Please visit the Holistic Core Restore page® for further details. Classes and workshops can also be arranged for NCT, private corporate or other groups. Please contact me for further details. New clients will be asked to complete a health screening questionnaire so I can assess if my services are right for you. If not, I can put you in touch with the right people.